the Fed just did an about-face on their tightening plan, they did so for a bunch of reasons, but most are tied to the fact that U.S. stocks started going down fast in the back half of 2018 for fears of a global recession. The worry was that their tightening might hasten a recession in the U.S. But the main point is that they stopped tightening because of the downgraded view of the global economy in the 10th year of the longest economic expansion in the last ten years. The chart of the 10-year treasury yield below is less than bullish for equities and the U.S. economy in my view as it reflects the late cycle nature of our economy. Just as some were calling the 2016 yield lows a generational bottom, we might have just topped out above 3% at what could be a generational top (the same spot we topped out in late 2013 / early 2014 during the taper tantrum. The next identifiable catalyst for Citi will be their Q1 results on April 15th. So what’s changed since Nov 30th, the last time I wanted to short CIti with defined risk? Well quite simply and very importantly, the Fed is out of the way as it relates to rate increases, which at one point in 2018, fed funds was pricing three quarter-point hikes in 2019. They are still reducing the size of their balance sheet, but even that the Fed has suggested they can stop at any moment. Beyond that, prior to this week, there was some optimism that the Govt would not shut down again and that we would make some sort of agreement on our trade dispute with China, pushing out more and higher tariffs. But reporting in the last couple days suggests that there might not be much progress on either, one reason for the weakness this week in equities, and for that matter treasury yields and oil. 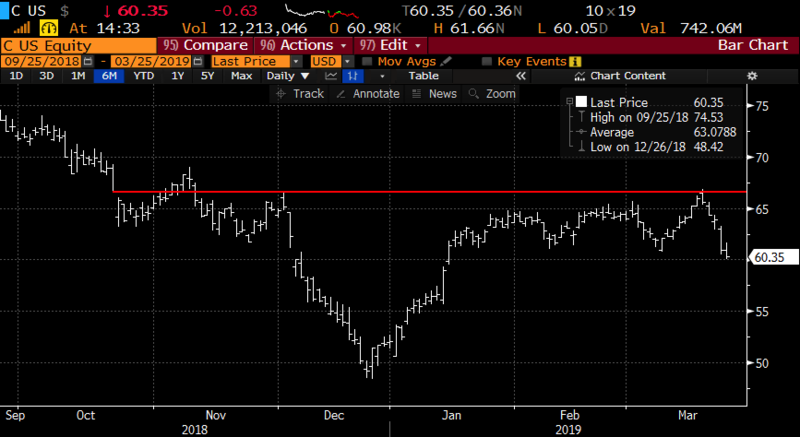 The earnings catalyst remains something worth targeting, but the trade might be ready for an adjustment with the stock at $60.30 with less than three weeks to expiration. The April 60 put that was bought on Feb 8th for $1.90 is now worth $1.75, while the April 50 put that was sold at 30 cents is now worth 12 cents, so the trade is basically unchanged. If I was still convicted on this trade I might lower my expectations for downside potential and look to roll up the short put strike. For instance, I might buy to close the short April 50 put for 12 cents and sell to open the April 56 put at 62 cents. This roll would result in a 50 cent credit, thus reducing my premium at risk from the original $1.60 to now just $1.10. But the profit potential is dramatically reduced to just $2.90. But given the time left in the trade, this seems like a reasonable risk-reward.